We may have a new corollary to one of the most famous lines from the movie It’s a Wonderful Life (“Teacher says, ‘Every time a bell rings, an angel gets his wings.’”): Every time #etmooc is mentioned, a learner gets new learning wings. Which, apparently, is exactly what happened as the Connected Learning MOOC (#ccourses) webinar about #etmooc—the Educational Technology & Media massive open online course—and the development of online communities of learning drew to an end last night. 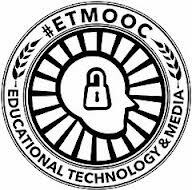 No more than 15 minutes after “The Case of #etmooc” concluded, an audience member posted the following tweet: “Just watched the live #ccourses webinar about #etmooc. Impressed = signed up for my 1st MOOC. Excited to learn.” And if that means another teacher-trainer-learner finds the pleasures and rewards of participating in connectivist MOOCs and the sustainable communities of learning they are capable of spawning, then we have yet another example of what well-designed and well-facilitated MOOCs along the lines of #etmooc and #ccourses can and do offer. There was something wonderfully circular, encouraging, and tremendously important there for all teacher-trainer-learners to absorb. The hour-long session began with #etmooc’s Alec Couros, two of his #ccourses co-facilitators (Howard Rheingold and Mia Zamora), and several #etmooc alums discussing what made #etmooc different from other MOOCs and, more broadly, from other learning experiences we had had up to the time we joined that course. As part of the current two-week-long #ccourses exploration of co-learning within connected learning opportunities, the session also served as an example of co-learning in action since the lines between learning facilitators (Couros, Rheingold, and Zamora) and learners (the #etmooc alums) quickly blurred—all of us were learning plenty from each other (and probably thinking about what we would next be doing to share those learned lessons with others). And it circled back to the idea of how interwoven our communities of learning are when Zamora surprised at least a few of us by telling us that she learned about connected learning by observing us in action while #etmooc was in progress. Turns out she had signed up for #etmooc when it was first offered in early 2013, but had little time to become actively involved: “I watched from afar,” she said. “I learned something from all of you…because I watched, because I lurked. “Transformation,” she continued, “happens in places that you cannot even see it happening, not even in yourself….Watching community build is also a powerful learning process. I think that’s what #etmooc gave me as a sort of out-of-the-gate kind of experience for this” experience of helping develop and facilitate the equally dynamic Connected Courses MOOC. And have no doubts: one of the most significant results of that hour-long session last night was that transformations were occurring. We could see that our explorations of what transformed #etmooc into a vibrant, vital, sustainable community of learning were also helping solidify #ccourses as another learning community that is likely to continue far longer than the formal period during which all of us are interacting within the current course structure. We could see that the same sense of openness—the commitment Couros and his #etmooc “co-conspirators” maintained to injecting a very human, personal element into that massive open online learning environment—was and is in play in the Connected Courses MOOC. We could see that the playful interactions among the session panelists reflected the playfulness that flows through #ccourses and just about every other successful, inspiring, and memorable learning experience we have—a reminder that we need to carry that level of playfulness, as much as possible, into the face-to-face and online learning environments we help create and nurture. Among the reasons cited for the transformation from student to collaborator to friend were Couros’s tremendous skills at facilitating conversations, his natural inclination to make participants feel welcome into that developing community of learning, and the playful introductory activities that included a crowdsourced communal “lip dub” that quickly drew #etmooc participants together while using the educational technology and media tools explored at that point in the course. As to the underlying question of what #ccourses facilitators and participants (and members of other learning communities) can do to create communities that outlast courses: there was an acknowledgment that connected learning endeavors have a tool we haven’t thought to develop in our more traditional learning environments—the learning environments (e.g., Google+ and Twitter communities united around a hashtag such as #etmooc or #ccourses) that don’t shut down as courses usually do when content within a learning management system is closed and archived beyond the reach of course participants. It’s not as if “we’re turning the lights off now” when a connectivist MOOC delivers its final lesson, #etmooc and #ccourses co-learner Rhonda Jessen observed. “Opening up the doors…was really cool,” our co-learner Erin Luong added. And as long as we keep those lights on and those doors open, we’re likely to see an extension and continuation of learning communities unlike anything we’ve ever seen. And many more wings. N.B. : This is the thirteenth in a series of posts documenting connected learning through #ccourses and other MOOCs. This entry was posted on Tuesday, November 11th, 2014 at 4:25 pm and is filed under ccourses, etmooc, training. You can follow any responses to this entry through the RSS 2.0 feed. You can leave a response, or trackback from your own site. Thanks for such a great summary of the Connect Courses hangout last night. I always enjoy reading your insightful reflections. I am looking forward to our next collaboration. Loved the lip dub! Did not see Paul Signorelli in there, though. Thanks for sharing your thoughtful insights into the mooc experience and new ways of connected learning! I think I stole (er, remixed) your blog title for my blog title, without realizing it. Or did we we both, eh, borrow from Alan? I love that my path and your path and others all intersect at so many points, Paul.